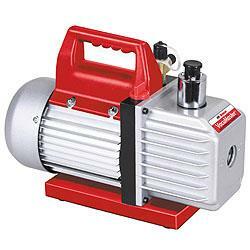 Robinair 15300 Vacuum Pump VacuMaster Series features a two-stage design with 3 CFM; second stage pumping only starts pumping at a lower pressure in order to pull a deeper vacuum. 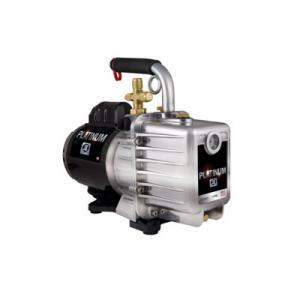 The Robinair VacuMaster only uses 7.4 oz of oil, equating to less maintenance costs over the life of the pump. 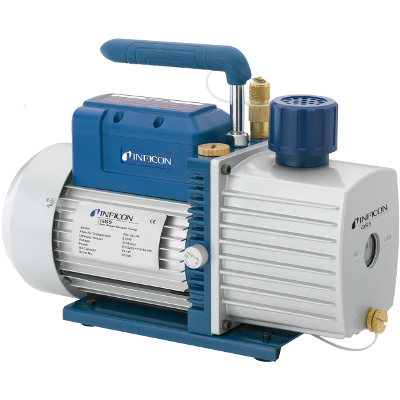 Lifetime Filtration - The intake filter prevents foreign matter from entering the pumping chamber, and an internal exhaust filter separates oil vapor from the exhaust flow. Direct Exhaust - The exhaust is expelled through the handle to direct it away from the service technician. 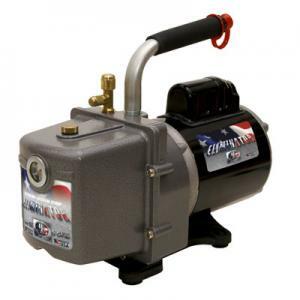 Sure-Grip Handle - The one-piece, molded handle makes it easy to carry the pump to and from job sites, and the handle stays cool to the touch during operation. Unbeatable price - High performance and quality for an incredible value.